For the past week or so, TCM has been airing the trailer for The Innocents, a 1961 British thriller scheduled to be shown this evening, June 8. The film is highly acclaimed and is a major film in the career of Deborah Kerr, as well as an oft-referenced masterpiece of horror filmmaking. The trailer for The Innocents. As a person who is truly terrified of the supernatural (I could barely get through The Three Lives of Thomasina as a child), the trailer really took a toll on me. Anything dealing with ghosts is something I have a really hard time with, and each subsequent time that this trailer aired, I found myself looking away from the TV until it was over. However, I felt that I should at least TRY to watch this movie tonight, as it truly is a monumental piece in the genre, not to mention the fact that I love Deborah Kerr. So I settled in to watch the movie, making sure to leave all the lights on in case it got dark. If I know my post-horror film fears, I won’t be getting up in the dark at all, for fear of a ghost attacking me. Robert Osborne picked this film to be shown during TCM’s “Creepy Old Mansions” marathon–alongside such films as The Black Cat, The Spiral Staircase, and Gaslight. Taken from the celebrated Henry James short story “The Turn of the Screw,” the plot deals with just that, a creepy old mansion, which the governess (Deborah Kerr) believes is haunted. Not only the house is haunted, she believes, but the spirits of the house have also overtaken the children’s souls. Kerr was really the only significant name in the film, though child actors Martin Stephens and Pamela Franklin later became moderately successful as well, and Michael Redgrave makes a VERY brief appearance as the children’s uncle. The first half hour or so is very benign. We are introduced to the characters, and everybody seems very normal, until gradually strange things begin to happen in the house–we hear creaking and see strange shadows, and Deborah Kerr discovers the token creepy music box during a game of hide-and-seek with the children. You know things are going to happen when the creepy music box is discovered. Then comes this scene, aptly described on youtube as being the scariest. We begin to learn the identities of these apparitions–those of workers at the mansion in the past, who had close relationships with the children. The children begin to act strangely as well, with the little girl often singing the tune from the music box at the edge of a lake, with a ghostly figure watching her from the other side. The boy is by far the creepier of the two, and there are some scenes with the little boy that are among the creepiest child scenes I’ve ever come across. On that note, I will stop for fear of giving away the ending. This film definitely belongs to Deborah Kerr. 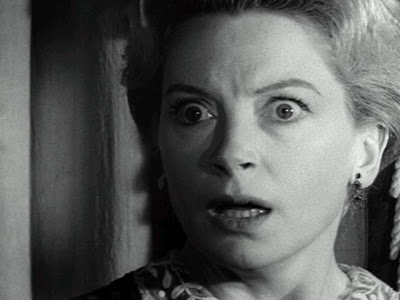 She implies everything with her eyes, and the viewer always knows when something bad is about to happen and how scared you should be–just by keeping a watch on Deborah Kerr’s eyes. She does a superb acting job, and it’s a real shame that she didn’t get any acknowledgment for it. The Innocents was nominated for two BAFTA awards (Best British Film and Best Film from Any Source), and director Jack Clayton was awarded the National Board of Review Award for Best Director. Deborah Kerr in a particularly harrowing scene. Despite my initial reservations about the supernatural aspect, I thoroughly enjoyed the movie, and found it to be very well-made and a marvelous thriller that really does stand the test of time. I would highly recommend it to anyone who can stomach a ghost story of this caliber. Lara, “The Innocents” is a real chiller in the most profound sense of the word. The question of whether something supernatural is afoot (ghosts) or whether the impressionable young governess (Kerr) is losing her sanity may never be definitively resolved (a debate has gone on about Henry James intent in the novel (“The Turn of the Screw”) for 80 years). Deborah Kerr is magnificent and has been quoted as saying it was her favorite of her performances. Her portrayal was certainly worthy of an Oscar nomination (looking at the list of nominees for 1961, her work in “The Innocents” was equal to the work of every actress nominated that year). I agree. The question of Deborah Kerr’s sanity kept running through my mind, and I spent much of the movie trying to pick up on hints as to whether this was supposed to be real or imagined. The closest I came is with that scene where she is running up the stairs with the housekeeper, talking very fast and almost incoherently about what she has seen. She looks insane. Also, the scene with Flora by the lake, when she tries to make her look at the apparition across the water. It seemed to me as though Flora were scared of HER, and truly didn’t see the apparition. I find that sometimes the scariest movies are those with things that are left unknown. Truly a perfect performance from Kerr, and a wonderful look at “The Innocents” from you. I second that Deborah Kerr gives a beautifully harrowing performance in this film. I’ve never seen the end (don’t know why), but I’ve seen enough of it to get the creeps! I’ll have to revisit it and find out what happens! Thankls for reminding us of it!